The year is 21XX. Reploids are commonplace now, after Dr. Cain rediscovered Dr. Light's old lab and based several designs off of Dr.Light's original, called "Megaman X." X, meanwhile, has joined the Maverick Hunters, and works with unit leader Zero under the command of General Sigma. It is their job to terminate rogue reploids, those who have become violent. Megaman X was first released in 1993. 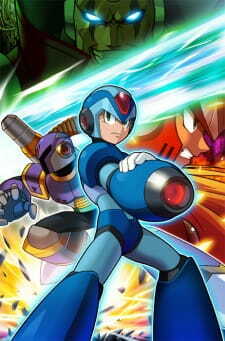 The series was the first of many spin-offs of Capcom's Megaman franchise and has been highly successful, receiving eight sequels (one being the Command Mission RPG), and a prequel OVA. That's right, back in 2005 Capcom and Xebec combined efforts and came up with an OVA prequel for the Megaman X franchise. Let's take a look at Maverick Hunter X: The Day of Sigma. The story is pretty simple. It's about how Sigma went from being a maverick hunter, to the head maverick. For those of you who aren't familiar with the games, reploids are robots with the power of self determination. Occasionally some of them go "maverick" and try to harm others or just go berserk. If you're a fan of the X franchise it's an interesting look at the way things were before Sigma's treachery, even if you already know how things are going to end. The Day of Sigma does do a decent job of fleshing out some of the characters a bit more than what you see of them in the games, especially Sigma and Vile. It avoids throwing in a bunch of characters from the games in order to keep things fairly clean and focused. Which does work to its benefit. The art is deliberately reminiscent of the games. The characters look good and the battle scenes, though short, are nice and intense. Unfortunately, the backgrounds are kind of dull. The voice acting is pretty well done. Sakurai Takahiro, Okiayu Ryotaro and Mugihito especially give strong performances. X is Cloud Strife, I just had to point that out. The music is pretty weak and forgettable. It could have benefited from doing more with the background music. The yuri factor is a 1/10. There's only one female character and she has a small role. My final rating for Maverick Hunter X: The Day of Sigma is an 8/10. If you're a fan of the Megaman X franchise you should definitely see it. If you aren't you should probably skip it since there's really nothing to appeal to non-fans. This movie is basically the prequel of Megaman X. The first Megaman X immediately before the first Maverick Outbreak. This game series was my personal favorite of all times and I played all 8 games to completion and I grew up off of this series. With that being said my only disappointment is the lack of a sequel and further coverage of the Megaman X timeline. There are dozens of un-answered about the crossover between the original Megaman and Megaman X. And even the Megaman Zero and Megaman.exe worlds. I had hoped that this would be the point of starting to fill those holes in and I feel like this did an ok job of explaining the world leading into the first Megaman X game and covered the state of the world very well. If you are a megaman fan and love the franchise then watch this movie. For those who love playing the Mega Man games and especially love playing the Mega Man X games, Mega Man-Maverick Hunter X: The Day of Σ is a great and the best way to get into the X games. It serves, as a prequel to how the original Mega Man X starts off and reveals how the primary villain of the X series, Sigma had become evil. To show trust in Reploids that haven't gone Maverick, the humans have allowed Reploid sympathizers to handle the situations involving the Mavericks by creating the organizational task force group known, as the "Maverick Hunters". At the head of the Maverick Hunters is leading commanding Reploid Sigma and two proteges with great gifted talent working under him, the Reploid considered to be the best of the best named Zero and his best friend and partner still in training named X. For a Original Video Animation, Maverick Hunter X proves to be entertaining in the 25 minutes long it lasts and it provides a bigger prologue background into Mega Man X1 then the original game ever did. The story reveals how primary protagonists X and Zero first started out in their Maverick Hunter careers and eventually go on to be the Reploid favorites that all Mega Man X fans both know and love them to be. All in all, Story, Art, Sound, Character, Enjoyment and Overall deserve high marks and Maverick Hunter X is a great way to get into both the Mega Man X series and the overall Mega Man franchise, whereas the original Mega Man could be considered cartoon, i would have to say that Mega Man X be considered more Anime like when comparing the two sub series together, nevertheless both sub series have equal amounts of creativity and replay value in their very own respects but on biased opinion, Mega Man X would be more enjoyable for slightly older gamers, as Mega Man X involves more of an in depth story and reveals how relationships between both humans and robots alike are on a thin edge, wondering if war will break out between them and if there is no hope for peace between them? He may have been created for the sole purpose of obtaining and achieving peace but he was also given free will to decide his own fate and his own actions, by choosing his very own path in life, X has proven that no matter what background you come from or even if you were created, upon being given free will, you are your very own person from that point onward...what you do with your free will and freedom itself...is up to you and you alone. Here's hoping my Review was helpful. This one-off Mega Man X anime was included as unlockable content in the PlayStation Portable's Mega Man Maverick Hunter X, a remake of the first game in the series. I beat the game, which was the prerequisite to gaining the video, but for some reason I never watched it. It was a little unfortunate, as this bears the distinction of being the best Mega Man anime ever made. That's not saying much considering their generally average quality and the fact the games themselves were never strong on story, but if you've gained an attraction to the world and characters simply through constant exposure among the huge franchise, then possibly nothing is better than scratching that curiosity for world expansion than this OVA. It's a prequel to the first game and details Sigma's turn from Maverick Hunter to Maverick, and X's evolution as a new Hunter. The writing is surprisingly okay, avoiding the contradictions of lore within its own storyline like many X plots do. The plot itself is as uncomplicated as you'd expect. X, Zero, and Sigma investigate the attacks of several unmanned robots, with some nice cameo appearances by Chill Penguin, Storm Eagle, and Vile while they're still allies. Music is complete background noise, but the animation is very solid with some subtle use of CG to give the machines some curvature depth and actual weight when combined with the mechanical sound design straight from the games. All in all, it's a solid OVA that brings a niche attribute of Mega Man (the story) to a level it hasn't really been at before, and while that's not a high water mark relative to general anime or video games, it means it carves a particular use and interest for Mega Man fans. why x so powerfull and zero so fearsome.